If you think about it, Star Wars isn’t really a science-fiction series. Its most popular stories have nothing to do with the ins and outs of hyperdrive technology, nor does it explore social issues through the lense of a futuristic setting. Instead, it is more of a fantasy series that happens to take place in space. The ships exist to get characters from point “a” to point “b”, and create epic battles that determine the destiny of whole worlds. Mystics with magic powers and laser-swords fight each other in service of a mysterious force that permeates the galaxy. What made the original trilogy so great is it embraced the fantasy genre, delivering an exciting and epic tale about a man attempting to reclaim his family’s honor from his tyrant father. It was fantastical, mysterious, and yet, somehow approachable. Ever since then, Star Wars has struggled to come up with new stories that resonate like the first movies. The prequels failed miserably. Some novels and comic-books did alright, but even the best among them is far from perfect. But in 2003 Bioware made the bold decision to release an RPG set in the Star Wars universe, but thousands of years before the original trilogy. The result was an incredible throwback to the mystery and wonder we first felt when we watched Star Wars for the first time. By going so far back, Knights of the Old Republic presented the player with a new world to explore, couched in the atmosphere and themes of classic Star Wars. The game was great, and still worth your time twelves years later. However, the story was held back by the formula Bioware had learned to lean on at the time. In 2004, however, Obsidian was given the opportunity to put together a sequel. Star Wars Knights of The Old Republic II probably would have been considered one of the best RPGs of all time, were the development team allowed to complete their work. When it was released, it was a jumbled mess of new mechanics and intriguing, yet unfulfilling plot lines. Thankfully due to a dedicated modding community, it’s now possible to play the game Obsidian was trying to create before LucasArts forced them to released the game in an unfinished state. A fully restored KOTOR2 experience is, in my opinion, the best Star Wars experience since the original films. It should not be missed by anyone who considers themselves a fan of Star Wars. The game was released in 2004 on Xbox and a few months later on PC. Because user made modifications are not possible it is not advisable to pick up an Xbox copy, as one would not be able to experience the restored content. The original release of the game is buggy and incomplete, barely worth anyone’s time except for die hard fans of the KOTOR1. But when it comes to PC releases, there are still options to consider. There are actually physical copies of the game floating around retailers. I’ve even seen copies at my local Walmart. However, the original build of the PC game is notoriously finicky. It is difficult to get it to run on some modern systems. Even if you do get it running, it can be very challenging to run at modern resolutions. Fortunately, Aspyr recently created a new build and released it on Steam with native support for higher resolutions. The best part is that the release was designed specifically to run on modern machines while supporting the latest version of the The Sith Lords Restored Mod. In the original PC release Obsidian included a bunch of assets, including voice-over work, maps, character models, and more that didn’t appear to be used in the game. Upon further investigation users found that the assets appeared to be intended for content that never made it into the game, due to its decreased time table. Overtime, the community began to restore some of this content, often with the help of the developers themselves. Over the years reworks of entire segments of the game, new dialogue, and even news areas to explore where added. Eventually the mods that best restored Obsidians original vision were combined into The Sith Lords Restored Content Mod(TSLRCM). This review is of KOTOR2 along with TSLRCM, as most people do not consider the game complete without it. There are other helpful mods available as well, but they are not essential to the experience. Most of them replace crappy 2D textures, modify weapons and armor, or make various cosmetic changes. KOTOR2 is eleven years old, and it looks like it. In fact, the graphics were considered to be a bit dated even for it’s time. That said, what the game lacks in technology is more than made up for with atmosphere. The designers had limited tools by today’s standards, so they relied on clever lighting and overall design to create an immersive enough experience that the player doesn’t notice the rough edges. Like its predecessor, KOTOR2 adapts the Wizards of the Coast Star Wars d20 tabletop rpg system to real time combat. It’s similar to Bioware’s adaptation of D&D 2.0 and 3.5 in games like Baldur’s Gate and Neverwinter Nights. Everything is ruled by die rolls, with statistics, equipment, and other factors modifying the result. Whether characters are using using a blaster, lightsaber, or force power, either they or their opponent rolls a twenty sided die (in this case, the rolls are done automatically by the computer behind the scenes) and compares it to a target number to determine the effect. Upon starting the game, players get to create a force-sensitive character to be their primary avatar in the game, according to the d20 character generation rules. Putting this right at the start of the game makes it feel a little daunting to some new players, but since players level so quickly no one is punished too much by their ignorance of the game’s rules. This all sounds very complicated to those not familiar with tabletop role-playing, but fortunately the game does a good job of keeping the mechanics out of sight, and allowing the player to focus on tactical decisions. Battles are cinematic in nature, with players controlling a camera that they can move from player-character to player-character, to quickly assess the situation. Players then choose from their options either through a small menu in the corner of the screen for actions that characters do themselves, or a small menu that hovers above enemies. These context menus help resolve the complexities of the system in a very simple way. Apart from combat, a character’s skills and abilities also have an effect on conversations you have with NPCs. Having a high “insight” skill, for instance, might allow you to sense an ulterior motive, allowing for an additional dialogue option that helps resolve a situation more favorably. And, of course, it’s sometimes possible to trick people towards your desired ends using The Force. Character skills also play a role in exploration. Whether it’s being able to detect hidden mines, or being able to use clever computer-hacking to disable opponents, non-combat skills play an important role in the game. This leads to interesting decisions as you level your main character and their companions – how much do you invest in these non-combat skills at the expense of combat effectiveness? These mechanics still feel very similar to the previous game, but there are some much appreciated improvements. Apart from a slew of new force powers, every skill plays some part in the game’s item creation system. In KOTOR1 you could modify equipment with minor upgrades, but in the The Sith Lords players create new equipment and consumables from components they find on their journey. If a character is well versed in, say, the “treat injury” skill, they are able to produce curative items easily, saving them piles of cash that they can put towards everything. This further nuances how player’s craft their characters. When you combine all of these different gameplay elements you get an experience reminiscent of old CRPGs like Baldur’s Gate or Icewindale. Thankfully, KOTOR2 sheds some of the negative baggage of those games (like fetch quests and crappy UI) to deliver an incredible game. As was alluded to earlier, the story is what makes KOTOR2 really stand out. While it would be worth checking out for its gameplay alone, the plot elevates it to a spot among the very best games of all time. It might sound a bit ridiculous to those who haven’t played it, but with TSLRCM the game’s story comes closer than anything else to being able to stand beside the original trilogy as an equal. In fact, I’d say that it even surpasses it in some ways. That said, my embarrassingly gushing enthusiasm only applies when considering the restored content. Without it, the story is a mess of unfinished plot-lines and seemingly lazily written characters, covered up with a thin veneer of mystical vaguery. The player character awakens alone on an isolated space station, with most of the crew systematically killed off by it’s droid workers. As the player explores the facility they are able to begin piecing together the character’s past. You are an exiled Jedi, judged by the council as a traitor to the order, and sentenced to wander the galaxy without purpose. The Sith Lords from which the game gleans its title are evil forces of epic proportion. As time goes by, their chilling backstories are revealed. Early on, for instance, the player learns that one of them has systematically broken every bone in his body and now holds them together with nothing but The Force. He fuels his affinity with the dark-side with the never ending pain this causes him, and the resulting nearly indestructible body makes him a next to insurmountable threat. Yet another is so traumatized by death and loneliness that he has become a physical void in The Force, driven only by an insatiable hunger for the death and suffering of others. By comparison, Darth Vader and Emperor Palpatine were identifiable villains. They were immensely powerful, but we knew that in the end, they were just people. People make mistakes. People can be defeated. But the Sith of KOTOR2 have shed their humanity, and are the physical embodiment of the evil they inflict. They are more like forces of nature than people. The sense of dread that their neigh inevitable victory over the galaxy creates a brooding atmosphere that permeates the whole game. It’s one of the darkest Star Wars stories ever conceived. And while it’s true that the original trilogy isn’t really though of as “dark.” KOTOR2 uses this atmosphere to truly immerse the player in the Star Wars universe. When you load up a save, you really feel like you are in that universe – not because everyone is talking about hyperspace and lightsabers, but because you immediately feel the strain of living in a galaxy on the brink of utter doom. To further draw out the dark themes, the player’s primary companion is a powerful force user named Kreia. She is an elderly woman who’s attunement to The Force has allowed her to live long past her time. Her past mirrors The Exile’s, as she too left the Jedi order for some unknown purpose, and she is also reviled by the Jedi for it. You see, at the heart of the plot is the philosophical influence that the Sith and Jedi have on The Exile and the decisions that she makes. The galaxy is at a tipping point due to a series of wars that eventually resulted in the ruin of the Jedi Order, the downfall of a powerful Empire, and has left the peaceful Galactic Republic teetering towards collapse. As The Exile deals with the Sith she becomes embroiled in the affairs of the galaxy and must make decisions that will decide the future of countless billions. But these decisions are up to the player. In KOTOR1, the player-character woke up with amnesia, creating a convenient excuse for a silent protagonist. KOTOR2’s bold decision to give the PC a narrowly defined past actually makes these decisions more rewarding, however, as they are informed by the player’s knowledge that she has been both a Jedi, and an enemy of the Jedi. A defender of the peace, and perpetrator of horrible violence in the wars. Kreia has walked both sides of the fence as well. But unlike the The Exile, who was driven largely by the influence of others, she intentionally embraced and abandoned both the way of the Jedi and the way of the Sith. The Exile is a victim of circumstance, while Kreia is a manipulator of said circumstance. Knowing the strengths and weaknesses of both the dark and light sides of the Force, Kreia mostly serves to chastise The Exile, whether it’s because she’s blindly adhering to the Jedi code, or giving into her hate and fear. The player really feels the tugs of these three competing influences – the Sith, Jedi, and Kreia. Its easy to see the wisdom of the Jedi’s reluctance to engage in the wars the lead to this sorry state of the galaxy. At the same time, one sympathizes with the incredible sense of betrayal The Exile must feel towards the Jedi, and the trauma inflicted upon her in wars past. Meanwhile, the desire to live up to Kreia’s hopes and aspirations for you is immense, and in tension with what one might normally do. Overall, the experience is dark, fascinating, and epic. There are throwbacks to the first game, tying The Exile to Revan in a meaningful way, and setting up what many thought was an inevitable sequel. The lack of a third game does take away the ending a bit, as some interesting events are teased at the end. But the story is strong enough to stand on its own, even if you haven’t played KOTOR1 (but you should, because its great). 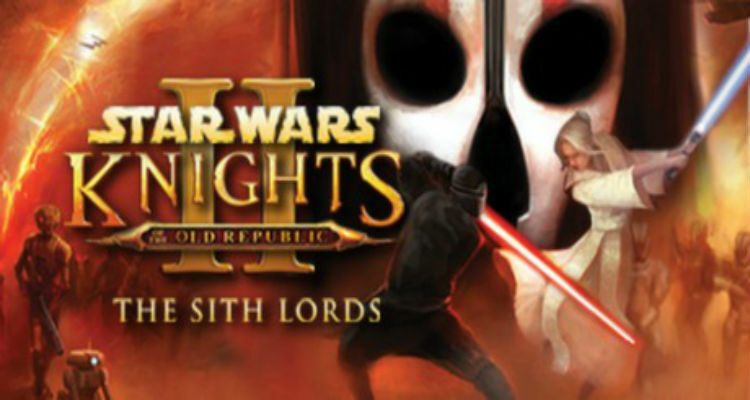 In case I haven’t been clear enough, I like Star Wars Knights of the Old Republic II: The Sith Lords. Hell, I’d say it’s the best Star Wars content produced since May 25th, 1983. It might even be the best thing since May 21st 1980. I’ll understand if you don’t believe my outlandish claims. Admittedly, talking about how great this game is makes me sound like I’m crazy. But it’s at least worth the pittance that the game is going for these days to at least see if I’m on to something here.